The movement of goods and means of transport from, across or to, the European Union (EU) involves many actors in the supply chain who must exchange information and comply with several pieces of EU legislation and, in particular, with Customs, transport, environmental protection, safety, and security regulations. This renders the process of cross-border operations highly complex. Over the past 20 years, digital technologies have reshaped the way industries and governments alike operate. International trade has been no exception, and the efficiency, reliability and cost-effectiveness of operations have been closely linked to the ongoing process of digitization. At both national and European Community level, several initiatives have been targeting the digitization of reporting procedures in order to facilitate information exchange and foster better cooperation between competent authorities across different sectors. Among available technologies, blockchain technology is seen as especially promising, as it would enable the development of new paradigms for supply chain digitization, and opens up areas of potential change in the way in which citizens, economic operators and public authorities interact. At its core, the blockchain is a decentralized, distributed ledger that stores information in blocks which are linked in a secure manner and disseminated through peer-to-peer technology to all the nodes, each of which contains a full copy of the information. The blockchain transactions are validated through a mechanism known as a consensus protocol, which is used to determine the blocks of data or transactions that will be successively added to the end of the chain as agreed among the stakeholders concerned. Since early 2017, the Directorate-General for Taxation and Customs Union (DG TAXUD), responsible for shaping policies and developing operational systems for the European Customs Union in collaboration with EU Member States, has been engaged in an exploratory activity to study the potential applicability of blockchain technology in both the Customs and taxation domains. In the field of Customs, this exploration has focused on the “notarization service” whereby a blockchain platform could be used as a third party for holding information generated by supply chain stakeholders. One document of particular interest is the ATA Carnet (ATA is an acronym of the French and English terms “Admission Temporaire/Temporary Admission”), an international Customs document used in 87 countries and territories that mainly permits the duty free temporary admission of most goods for up to one year normally. The ATA Carnet eliminates the need for a Customs declaration at border points and the lodging of a guarantee, bond or cash deposit in the country of temporary importation. It can be used for a trip covering more than one country and include numerous exits and re-entries in the country of origin during the period of validity of the document. Each country in the system has a single guaranteeing body approved by national Customs authorities and the International Chamber of Commerce World Chambers Federation (ICC WCF). A national guaranteeing association (NGA) is entitled to issue Carnets and to authorize local chambers on the national territory to deliver them on its behalf. Processing fees apply as well as a surety bond which will be returned if the Carnet has been used correctly. Discussions about the possibility of moving towards a paperless environment for ATA Carnets began several years ago between Customs administrations and ICC WCF, which manages the ATA Carnet system. The eATA project aims to digitize the temporary admission process by providing worldwide electronic data exchange between countries or Customs unions (ATA partners) using the document. The EU is supporting the project as part of DG TAXUD’s electronic Customs multiannual strategic plan. ICC WCF is currently implementing a system which replicates the paper ATA Carnet procedures using a digital solution called “Mercury II.” The solution, based on “traditional” technology with a centralized database, is hosted by ICC in Paris, France, and will be mainly used to register the Carnets and their movements as they are certified by Customs offices along the goods’ journey. In the second half of 2018, ICC will launch a pilot to test the application. (1) Using the “National Issuing and Claims Systems” (NICS) or Mercury II, a person orders a Carnet online, or, if a Carnet is already held, additional certificates if more trips are planned than originally anticipated. (2) The “holder” then downloads the Carnet into a safe wallet, stored in a smartphone, and can share it with his/her representative. The Carnet is encrypted and exchanged over secured communication channels. (3) When crossing a border, the holder, or his/her representative, unlocks the wallet and shows the QRcode to a Customs officer. (4) The Customs officer scans the QRcode, examines the general list of goods covered by the Carnet, and then reports whether the goods entered or exited the country under a temporary importation, transit or temporary exportation procedure. (5) The transaction is recorded and the holder or the representative receives a confirmation message through his/her smartphone. (6) Customs can issue claims through the system and manage them with the NGAs. In June 2017, a partnership between DG TAXUD and ICC WCF was established whereby DG TAXUD launched a proof-of-concept (PoC) project to see whether an application based on the blockchain could interface with ICC’s Mercury II solution in order to add an extra layer of trust to the process. Key requirements that would justify the use of blockchain technology are met: multiple stakeholders need to have access to the same data, and there is mistrust between those stakeholders in using each other’s data. 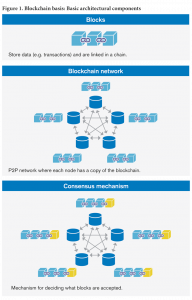 The PoC project reached a successful conclusion in mid-2018, and has demonstrated that distributed ledger technology (the Ethereum test network in this case) could be used to ensure the integrity and traceability of Carnets and transactions on a private blockchain platform combined with periodic anchoring on a through an anchoring mechanism public blockchain, effectively achieving independent notarization as shown in Figure 2. The distinction between public and private blockchain is related to who is allowed to participate in the network, execute the “consensus protocol” and maintain the shared ledger. 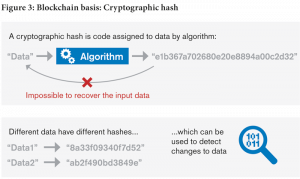 Hash functions are a fundamental part of blockchain technology. In a blockchain, documents or data are hashed, which means that their content is summarized and represented as a unique 64-character string. The hashed value of the previous block is used to calculate the hashed value of the current block, thus creating a link between the blocks. Under the PoC project, a hash of the actual data related to the Carnet or a transaction is stored on the blockchain, guaranteeing the true version of a document at any given time and providing a digital fingerprint of a document or transaction. Obtained by an algorithm which prevents reverse engineering of the original document from the fingerprint, the hash ensures that even a single comma change in a document would result in a totally different fingerprint. 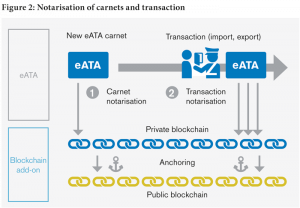 The blockchain test network that was built as part of the PoC project stores only the hash of the Carnets or transactions plus a few metadata, thus allowing automated consistency checks of ATA Carnet movements to be carried out (as shown in Figure 4). Ethereum smart contract blockchain technology was used to make such checks possible in this business context. The combination of private and public blockchains for the notarization process allows the benefit of a private blockchain (in particular to lower the costs of writing information on the blockchain) to be maximized whilst benefitting from the strength of a public blockchain (such as Bitcoin), which has a very large number of nodes. Writing on the public blockchain has a cost – as a result, during the PoC project only periodic anchoring on the public blockchain of the latest hash stored on the private blockchain took place (only hash of information is stored on the public blockchain, hence there are no data confidentiality issues). This was a win-win scenario with an optimal approach that benefitted from harnessing the public blockchain at a reasonable cost. Although DG TAXUD does not intend to make the PoC project operational, lessons learned during the project will benefit the stakeholders who are involved in the digitization of the ATA Carnet procedure. 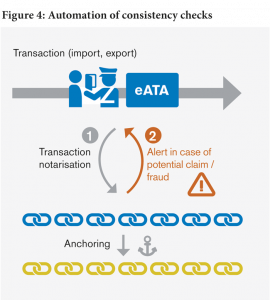 Several Customs authorities interested in the digitization of the ATA Carnet procedure expressed a lack of trust in a solution such as Mercury during meetings of the WCO eATA Steering Committee and the project shows that the use of blockchain technology could offer a potential solution, including the strengthening of stakeholders’ trust in the system.